The editor of the Faith Page asked me to answer the question--Are hunting and fishing consistent with religious values?. I was thrilled to have the opportunity to do that and to reach a broad audience. This was printed on February 15, 2014, but so far they have not posted it online. ARE HUNTING AND FISHING CONSISTENT WITH RELIGIOUS VALUES? In his “Hunter’s Poem” Lemuel T. Ward described his final hunt. He shot two geese who fell to the ground near him. He watched as the male bird called to his mate. “And she dragged herself to his side,” he wrote, “...Then covering him with her broken wing, and gasping with failing breath; she laid her head against his breast; a feeble honk, then death….” With tears streaming down his face, Ward buried the birds and threw his gun in the bay, never to hunt again. 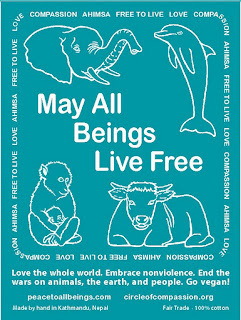 The Buddha said, “All beings tremble before violence. All fear death. All love life. See yourself in others. Then whom can you hurt?” Ward saw himself in those dying geese, and he could never again do such harm. The Jain religion promotes living a life of harmlessness to all living beings. St. Francis of Assisi said we must not hurt animals and that we actually have “a higher mission—to be of service to them…” May we all awaken to our highest calling and finally bring peace to earth for all beings. © 2014 Judy McCoy Carman, M.A. 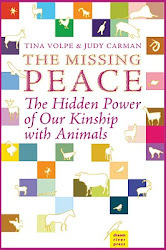 Co-Author with Tina Volpe of The Missing Peace: The Hidden Power of Our Kinship with Animals. Here is the complete Hunter's Poem. The article was limited to 300 words, so I couldn't include it in the article for the paper. we felt it should be shared.